I do not like drinking milk so I could never enjoy Hot Chocolate. But I love chocolate and the attraction has persisted. Last year I discovered turmeric Latte made with almond milk. It felt as if I was in heaven when I would have the time to make it with my own hands and savour drinking the cuppa. With time, the attraction to Turmeric Latte waned. I know it sounds fickle. But wait for it, I was meant to go on to discover something even more delicious – Spiced Hot Chocolate. I tried Almond milk version of Hot chocolate. I loved it but missed the spices. I decided to not listen to the strict inner voice telling me to keep the two drinks separate and pure. 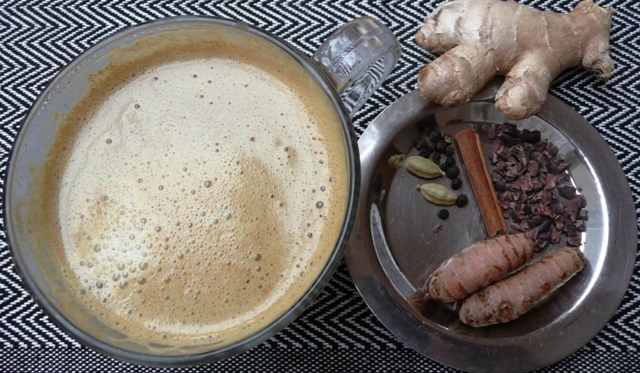 I tried adding raw cacao nibs to the turmeric latte recipe and loved the combination. To me it tastes divine. Last winter I felt that turmeric latte was my hot drink of the season. This year my vote goes to Spiced Hot Chocolate. You can try either of the two recipes, both are winners. 10 almonds soaked in water for at least 4 hours. I find it easier to let them soak overnight. I prefer to peel the almonds, discard the skin and any discoloured almonds. I know that it sounds laborious and time consuming. But do try to make the time for this ritual. Slow down, peel them really slowly, mindfully and see how it makes you feel inside. I find slowing down helps me to synchronise my rhythm to the rhythm of the Earth, slows down my breath and helps me to feel more in my body and in the present moment. Slowing down has also helped me to do the household chores with acceptance, dare I say it with enjoyment even! So much so that I do not like to use the word chore anymore for household work. Perhaps this is helping me to start understanding the Zen practice of ‘chop wood and carry water’. If you wish to make Spiced Hot Chocolate, just add 1 tbsp of raw cacao nibs to the blender. The recipe is simple – put all the ingredients in a blender with 1 cup of hot boiling water. Blend, pour in a cup and enjoy the drink. Make time to sit down, hold the warm cup between your hands. Savour the warmth in this cold weather. Drink slowly. You can vary the ingredients to suit your taste. The recipe is very flexible. For example, you can replace ginger and turmeric with powdered version, if you do not have them fresh. I prefer the fresh version as it not only tastes nicer, I trust it is more nutritious, and will be absorbed more easily by the body. All the ingredients are so healthy, they may also help keep the bugs away at this time of the year. I make 2 – 4 cups at a time, with just 1 cup water and store the leftover in the refrigerator once it has cooled down. It lasts for up to 2 days. All I have to do is add hot boiling water and my drink is ready. It was not easy for me to pause, stop drinking this delicious creation and take a photograph. But when the inspiration comes, I know that I have to do this, the thoughts, the words keep coming and time becomes available in my day, to sit down and create a blog post. Do try and leave a comment if my sharing inspires you in some way, either to try the recipe, make the drink or to slow down, or to do some writing or create something else in a way that only you can. Nobody else can do it in exactly the same way. Any questions, I would love to be able to help. You can contact me through my website.